On the walls of The Berkshire Men's room urinals in the newfangled, Truman-show-like Stapleton town center is transcribed the famous conversation between Homer and Lisa Simpson, where Homer questions the seemingly illogical test of will that is to be vegetarian, and at the same time learns that pork chops, bacon and ham all come from the same animal. "Right Lisa," he taunts, not believing her, "Some wonderful, magical, animal." It is hilarious moment in the show's history that people like me inevitably giggle at no matter how many times we have heard it repeated. I'm glad to see it written out, word for word, in a public place like a men's room wall. And it's not some drunken vandal that did it, unless he painstakingly stenciled the letters in a intoxicated state of precision and exactitude. No, it is clear that the Berkshire shares both my childish sense of humor and of course, my adult love of pork. For not only are there excerpts of the Simpson's in the bathroom, but everywhere around The Berkshire there are odes to pork (and beer), and probably it is because of this that I always feel so welcome here. I also feel welcome here because the staff and bar keep are, well, welcoming. And friendly. I have been here many times over the past couple of years and I've always had friendly table service and generous pours at the bar. What I also appreciate about the Berkshire is that they don't overdo it. To continue with the Simpson's analogy, there is no one at the Berkshire standing over your shoulder and ordering you to butter your bacon or bacon up your sausage. ("Butter it!") No, in fact, the menu does not get at all carried away with bacon, which is nice to see in an age where even pork lovers like me are taken aback by the amount of food that is bacon-ized. In fact, the Berkshire even goes so far as to try and make friends with salad. Not only are there side salads (better to go for the sweet potato fries), but a whopping six dinner salads on the menu (although two come with pork and/or ham). So if your heart hurts, there are plenty of less-fatty options. I've never had any, but I'm sure they are good. What they do make with pig parts, they do well. And several in superb style. One thing I love is that they always have jamon serrano on the menu, and it can often be seen hanging over the meat slicing station (yes, they have one of those too, and they call it the 'bacon station'). They also slice up a nice Spanish chorizo and a good salami. All these can be sampled on a meat platter--though last time I was there I saw it being served with slices from a King Sooper's baguette behind the bacon station. And with Udi's fabulous breads right across the street that borders on unforgivable! But what they do with those meats on the rest of the menu makes up for it. What they do right is an absolutely perfect and simple serrano ham and fresh mozzarella sandwich. It is good because you can taste every subtle flavor of the serrano, and all the other ingredients-- tomato, oil and vinegar shine in the background. The muffalleta is also good, done with the serrano, chorizo and salami. Topped with provolone and an olive tapinade, it is not the most traditional, but it is a fine sandwich. My other favorite sandwich is a brunch specialty: a Monte Cristo sandwich with jamon serrano between two slices of French toast. My wife's favorite is pure gluttony: the King. 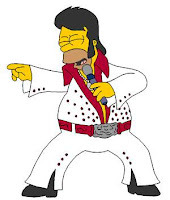 Actually, maybe it should be re-named the "King Killer", as it is at least in part responsible for the not-so-glamorous demise of Graceland's most famous citizen. It is, of course, bananas, peanut butter and bacon. The bananas are caramelized and the bacon is wonderfully thick and crispy. Served between two fat slices of Hawaiian bread spread thick with gooey peanut butter, it is disgustingly good. I have also tried a dinner entree or two, though I find the prices a little high and prefer to stick with the sandwiches. That being said, the double bone-in pork chop stuffed with apples and white cheddar cheese that I had on one occasion was well-cooked and wonderfully rich. The pinnacle of the porkiness here is a sophisticated flight of house-cured bacon. The first is balsamic-marinated and served with a sliced strawberry; the second is cinnamon-chipotle with a single raw almond; third is a curry-flavored slice with fig; and lastly a (heavily) garlic-powdered slice with roasted garlic. Each one presents a nice flavor combination (expect the garlic--save this for the end because it is pure garlic) and is highlighted by the fact that you are eating bacon. Good bacon. Very good bacon. As I said, there are plenty of items I haven't tried at the Berkshire that may very well be good. They even have a deep-fried Snickers bar if you are so inclined. And just so it won't seem that I am on the payroll (not that I wouldn't mind free bacon flights for life), there is at least one negative thing I have to say besides the King Soopers loafs in the kitchen (which is worth repeating): the pulled pork sandwich is just not that good. It's too bad in a pork-centric place like the Berkshire, but it is consistently dry and way too salty. The Berkshire appeals to the gluttonous Homer Simpson side of me, but it also does so with a certain degree of class. And again, the staff is welcoming as is the place itself. I haven't sampled much of their dinner entrée menu, mostly because when I go there I feel like a beer, some bacon and a good sandwich with some of their great sweet potato fries. So when your in the mood for some pork, check out the solid sandwich menu at the Berkshire. It doesn't have to be bacon day. Re the pulled pork—do you know how they prepare it? Slowly? All the menu says is slow-cooked.